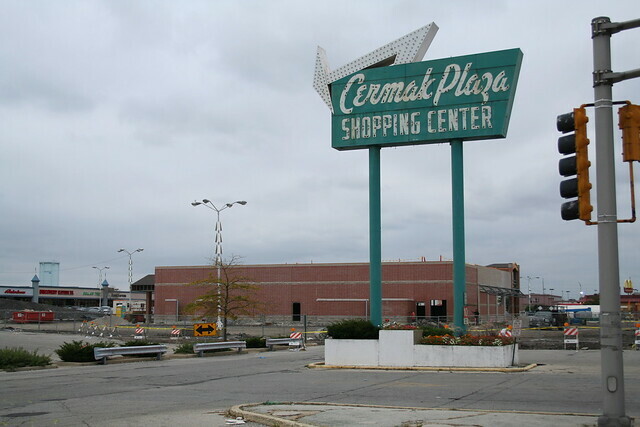 It’s not possible to discuss Mid Century Modernism on Cermak Road without bringing up the famous Cermak Plaza Shopping Center. 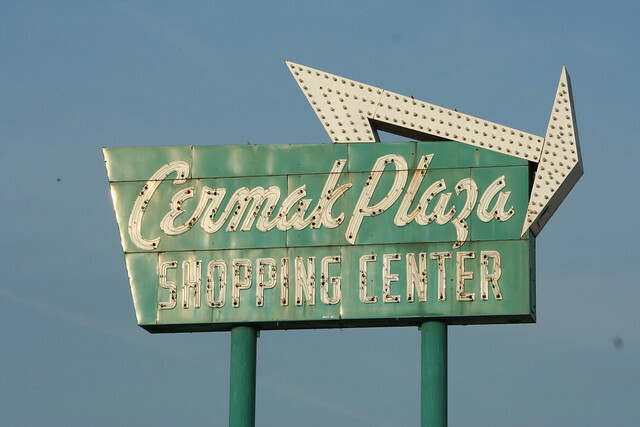 Cermak Plaza opened in 1956, a Modernist styled shopping center primarily noted for its excellent neon signs. 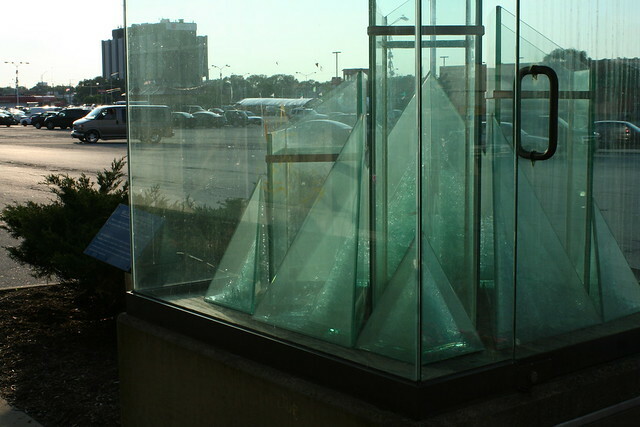 After losing its prominence to newer and larger shopping destinations further west, the center gained notoriety in the 1980s when the progressive-minded owner began installing works of modern art all around the grounds. Moonbells (Bell Tree Quartet). In the distance, the “floating McDonald’s” which was inexplicably altered to no longer float. The first and most notorious piece, Big Bil-Bored, came down in 1993 due to structural deterioration. 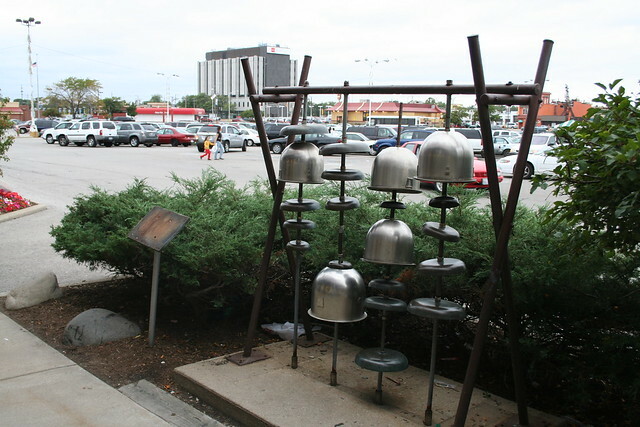 The most well-known sculpture, the automobiles-on-a-spike installation known as Spindle, was destroyed in 2008. Various other pieces had also come and gone by the time I made my first photo visit later that year. Above, the Walgreens outlot building that displaced Spindle. 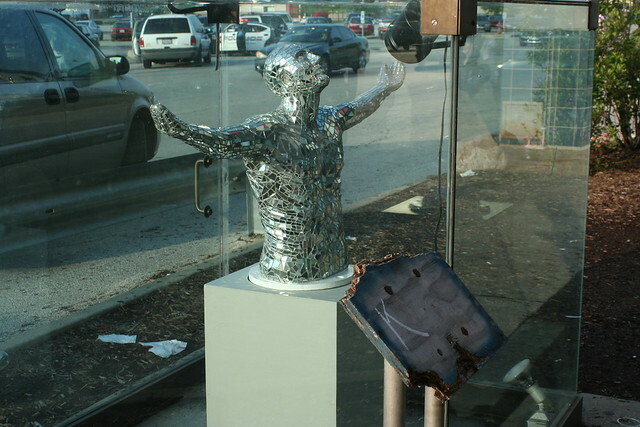 On a return trip in 2009, I captured several more works, as well as some of the store frontage in the background. 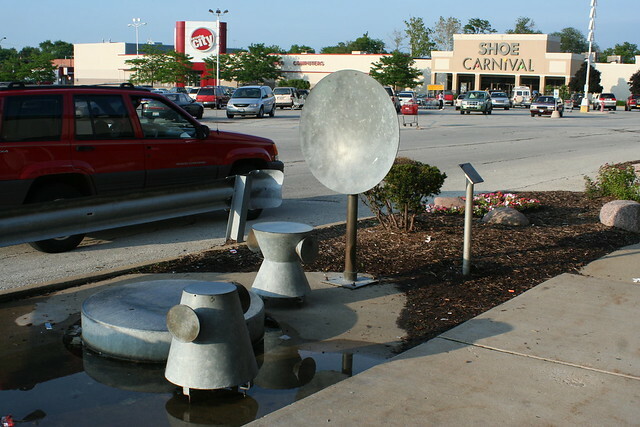 Cermak Plaza in 2008 was on its second iteration, with a series of Post-Modern Dryvit structures tacked over its original Mid-Century elements – faux castle towers in a 1980s color palette. 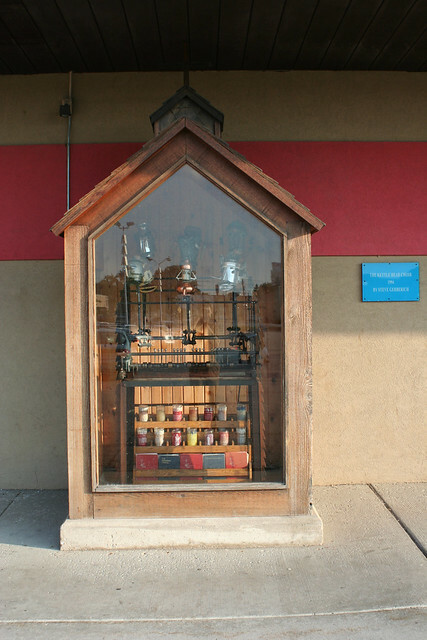 Some of the original elements still shone through, particularly the old Service Merchandise store, unaltered except for a shed roof tacked to the front. 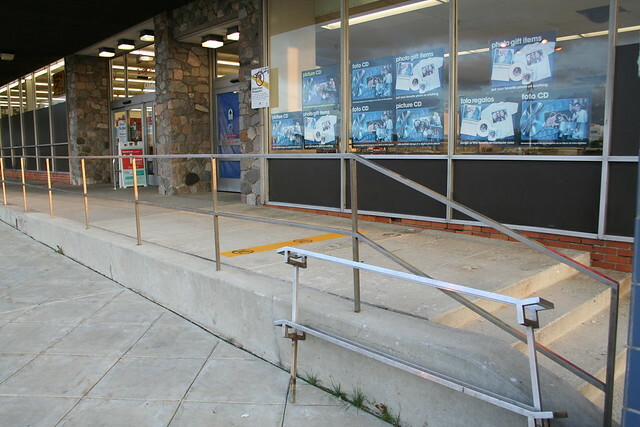 The Walgreen’s also retained some of the 1958 design, too – rough stone at the entrance, and stylized stainless steel railings along the walkways. 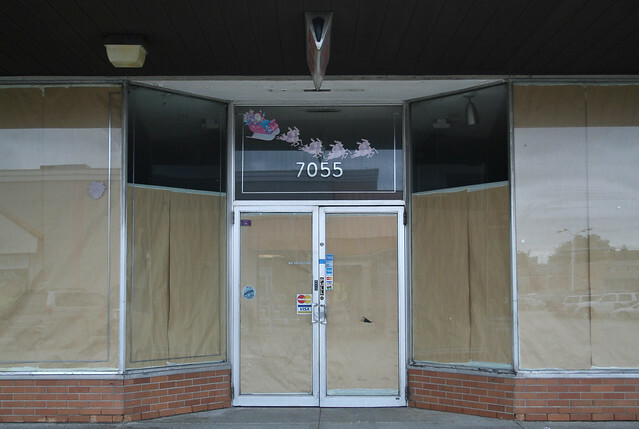 A handful of the original storefronts survived as well. 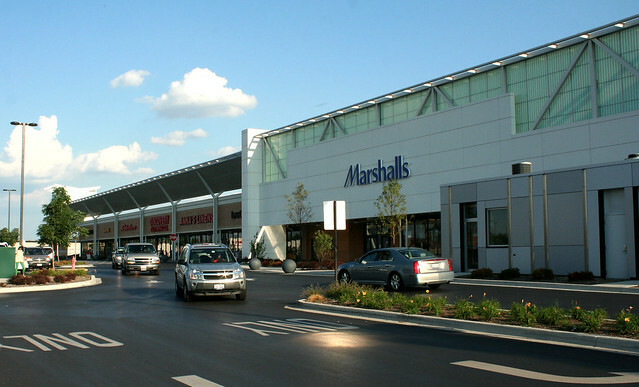 Beginning in 2010, the plaza’s owners gave the aged shopping center a second face lift, dramatically updating it to a contemporary look. That renovation would mean the removal of almost all the remaining artwork, but it also re-established the center architecturally – sweeping away the incredibly tacky Post-Modern add-ons, and replacing them with some dramatic contemporary design. 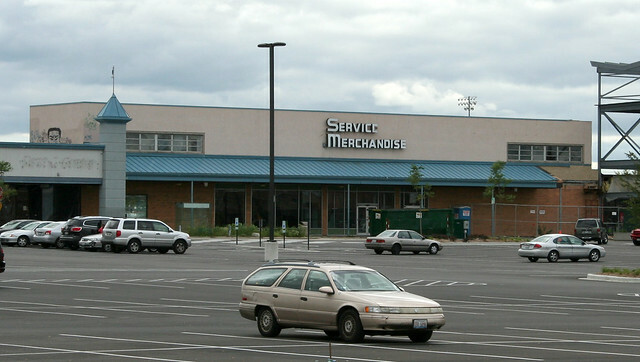 On the flip side, the Service Merchandise building was demolished in 2011; it has been replaced by a Meijers whose Dryvit facade dwarfs the previous building in scale. 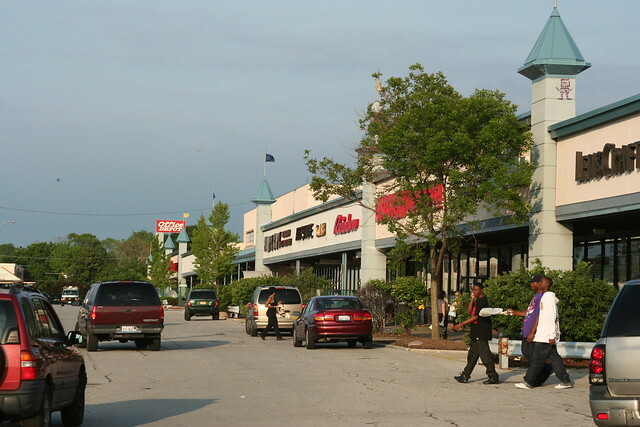 Above: The renovated space previously occupied by Walgreens; the Pinto Pelt sculpture formerly hung on the wall at left. 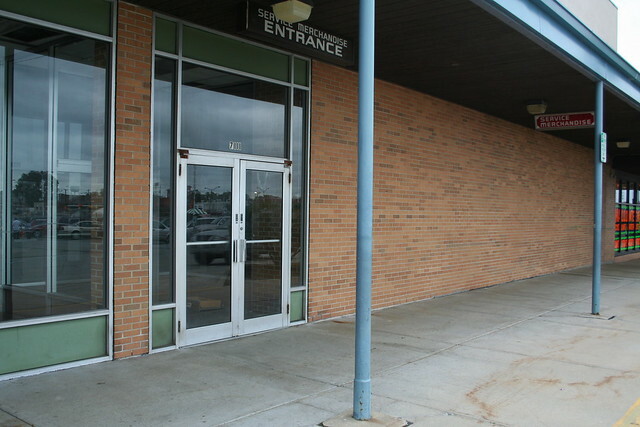 The stone around the entryway has vanished, but the original storefront panels are still in place. 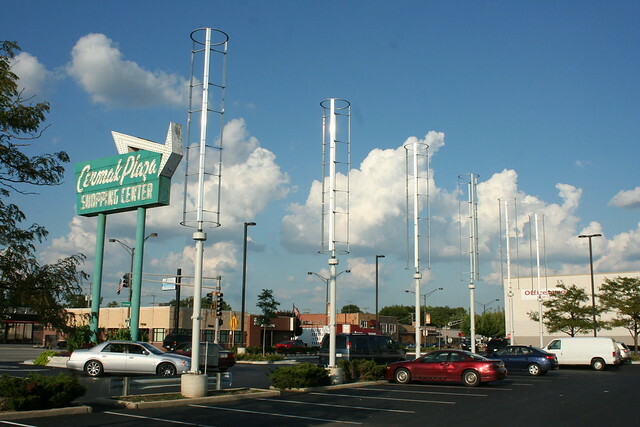 The art may be gone, but some of its spirit is retained in a group of peculiar wind turbines in the parking lot. The turbines generate electricity to power the lights, and sometimes return energy to the grid. The neon signs, meanwhile, were brought down in 2012 for repairs, but found to be beyond salvage. Backlit plastic signs temporarily took their place. Modern duplicates of the original neon signs were fabricated and installed, and the difference is practically invisible. 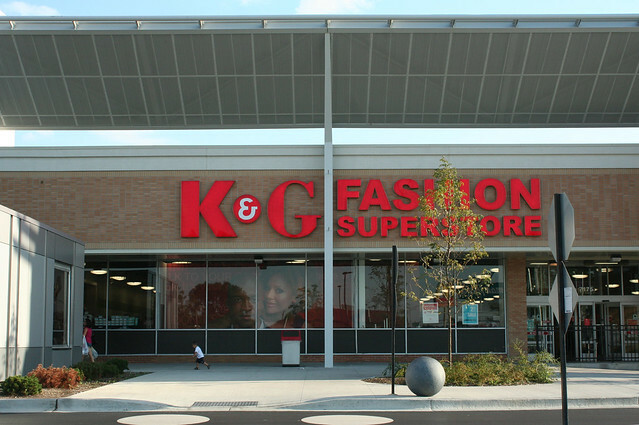 Cermak Plaza’s architectural story is among the most interesting a shopping center could have; it is one of continual change – sometimes for the better, sometimes worse. I might mourn the loss of the Mid Century design elsewhere; here, it appears something better has, by and large, taken its place. The disappearance of the artworks is more lamentable, and removes the quirky character of the place – but the restoration of the neon signs keeps the continuity of memory intact. 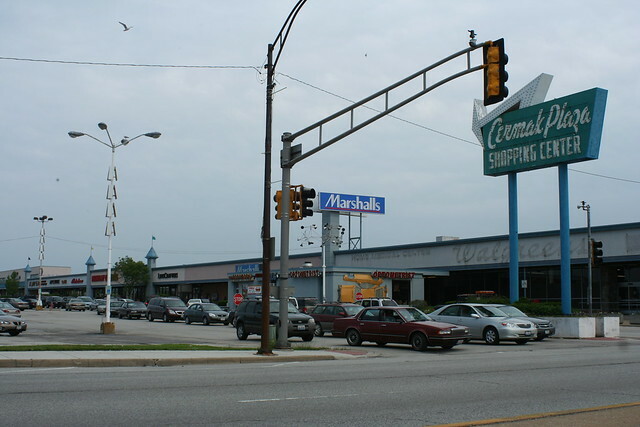 This entry was posted in Cermak Road, Mid-Century Retail and Storefronts, Midcentury Modernism, Roadside architecture. Bookmark the permalink. Another interesting post. Don’t know what we will do without you posts. Everything East of Meier at Cermak Plaza was demolished this week. Man, I remember all the art and the Plaza even from so far back when I was 3. It’s a terrible shame to see it all gone.